In many places, holding onto your phone while driving is illegal. And if caught doing it, you risk paying hefty fines. This is because you are not only putting your life at risk but those of others as well. Many people don’t know that momentarily losing focus on the road even for a few seconds will have grave consequences. According to the United States Department of Transportation, 3450 lives were lost in 2016 because of distracted driving. One of the leading causes is trying to access your phone to answer/ make a call, or view text. It also happens when you stretch your hand to reach the phone or holding it while driving. Rather than endangering your lives and that of other people, you should consider fitting a magnetic phone car mount. 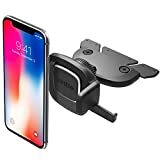 In this article, we will briefly show you how do these phone mounts work then we will list down our seven top-pick magnetic phone mounts products. How Does A Magnetic Car Phone Mount Work? Why We Chose The Above Units? As the name hints, this mount will hold the phone on your behalf while driving. You won’t need to place it in your pocket, bag, or purse and this improves convenience. Also, it will provide more accessible and quicker access since you put it at eye level or at the most convenient point. The unit comprises a holder that is typically attached to the car’s dashboard, air vents, windscreen/ windshield, or rear view mirror. It will feature clips that connect to the vent fins or an adhesive. The strength of the clip or adhesive varies from product to product, and you should ensure you get the best. It has a built-in magnet that attracts metal on the phone ensuring it remains firm. A kit also includes 2 or 4 metal pieces that are fitted on the back of the phone. 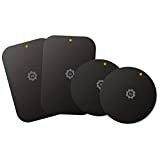 They come with an adhesive for attaching to the phone and feature different size metal pieces to serve various phones. The strong magnetic force of the mount attracts the metal bits attached to the phone securing it properly. A good unit will handle the vibrations well preventing the phone from falling. Good holders are very flexible and can be placed in various locations as per your desires. 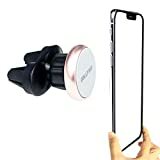 This Rose Gold colored cell phone mount is designed for car use and comes in a clip design to attach to the car air vent. The lightweight unit is compatible with Samsung, iPhone, Sony, HTC and other types of phone. It is build of TPR and TPU materials and has a smooth finish to protect the phone. Also, the kit comprises the holder, 1 round, and 1 square metal plate. All you need is simply clipping it to the air vent. It stays firm even on rough surfaces and doesn’t affect the signal or communication. This universal car mount holder works with a range of cell phones including iPhone, Samsung Galaxy, HTC, Sony, and LG. It is fitted to the car air vent horizontally or vertically and won’t easily come off because of the tight grip. The rubber protection improves the stability and also protects the phone from damage and vibration. What’s more, it has a powerful magnet for securing the phone and preventing falling while the 360-degree rotation allows viewed the phone from different angles. The metal brackets fit nicely on the back of the phone and won’t affects its functionality. Viewing your phone will be safer and convenient with this phone car mount. The unit works with any phones and tablets and is easy to fix and operate. You simply attach the adhesive side to the car’s dashboard, windscreen, or any other suitable location. This Stick-on universal magnetic car mount is easy to use. It mounts easily in the car’s dashboard and stays firm. The lovely design works with Samsung, iPhone, LG and many other smartphones. The black piece looks good with different styles and colors of dashboards and is also easy to remove. Also, it doesn’t leave any marks or stains and also won’t ruin the material. 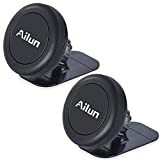 The reinforced car mount holder has strong magnetic attraction and does interfere with the air flow in the car. Other than car use, it’s also good for the office, home, and other places. This phone car mount by iOttie will suit iPhone, Samsung, LG and other types of phones that measure 2.3-3.5 inches. It has a universal design and fits without any modification and still look nice inside the car. The simple device has an Easy One Touch mechanism for easy release and locking of the phone. In addition, it has a plastic bracket for quick mounting and will attach to the car’s CD slot. The smooth surface protects the phone from bumps and scratches and is also easy to wipe. It has a 360-degree swiveling ball for varying the viewing angle. This car mount holder contains 4 strong magnets to secure phones, GPS devices, and tablet. It links to the car’s vents without problems and has a nice surface to prevent scratching the phone’s or dashboard’s surface. It can be mounted either horizontally or vertically and includes soft rubber prongs for maintaining a tight grip on the phone. On top of that, the circular metal plates are fit for smaller lighter phones and the rectangular ones for larger heavier phones. 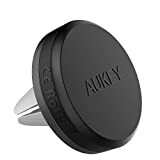 The AUKEY mount is good for iPhone(X/8/8 Plus/7/7 Plus/6s Plus), LG, Nexus and Samsung Galaxy among others. Mounting your phone or tablets for easy viewing in the car begins with installing this mount. The WizGear piece comes in a 2-pack and comprises 4 metal plates, a strong magnetic head, and a robust rubber base. It fit for different dashboards and stays put even in rough sections to prevent the phone from falling. Inserting and removing a phone or tablet is simplified by the Fast Swift –Snap Technology while the lightweight reduces the strain it places on the dashboard. Furthermore, the swivel design improves visibility and adjustability while the slim profile minimizes obstruction of air flow. It works with iPhone (X 8 7 Plus 6S 6 5s 5 SE) Samsung Galaxy (S9 S8 S7 S6 Edge,) LG (Note, G6, 8 5 4 2) as well as mini tablets. Holding the number one position on our review is the Maxboost phone car mount. The magnetic unit works with different cars and easily slips inside the vents. It has a pre-installed metal plate on the reverse side and maintains a strong grip to prevent accidental slips. The kit features 4 strong magnets and has a thin case for maximum magnetic attraction. Moreover, the dual claws improve the hold even in a shaky environment. And just like installing, removing the phone mount is easy and won’t damage the surface. It is compatible with most smartphones including HTC, iPhone, Galaxy, Xperia, Pixel, Nokia, LG, and Nexus. Easy to Use: The above units are very easy to use even for a complete beginner. They are very simple and basic and take a few minutes to fit. The lightweight piece won’t exert too much pressure on the vent opening and give you convenient access to the phone. They are not heavy or bulky and keep the phone safe and secure. Versatile: Another reason for picking the above items is because of their flexibility. 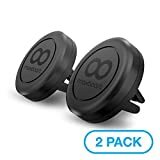 You can use them with different types of phones, can place them in most cars, and most can be used on the dashboard or air vents. The sturdy clips or adhesive won’t ruin the dashboard’s surface or vent fins. Minimal Obstruction: These simple devices don’t cause any obstruction to your driving. They have a space-saving design, are very small, and also very lightweight. And considering that they are adjustable, you can change the position at will. Non-Messy: Unlike other types of phone mounts, the above pieces won’t ruin the air vents or dashboard appearance. They won’t leave any adhesive/glue on the surfaces, stains, or discoloration. The devices also won’t peel the material or break the fins in the air vents because they are lightweight and don’t grip too tightly. Strong Magnetism: We picked these pieces because of the strong magnetism. Chances of the phone slipping because of road vibration are minimal. And despite the strong magnetism, it won’t interfere with other phone functions such as GPS, Bluetooth, or signal reception. Elegant: These mounts are very stylish and won’t undermine the car’s beauty. They feature modern designs and simple colors to complement most interiors. You also have a broad range of colors to pick from. The phone is an essential part of modern living, and many people can’t stay away from it even for a few minutes. However, using or handling it while driving can have negative consequences. It will momentarily distract you from the road ahead and increase the chances of an accident. Also, holding the phone while driving is prohibited in some places, and this can lead to penalties and fines. A magnetic phone mount provides a good holding point for the phone and also gives you easy and quick views of the phone. You can place it on the windshield/windscreen, air vents, rearview mirror or dashboard. 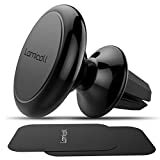 We have here reviewed the best magnetic phone car mounts in the market. They are easy to install, flexible, offer a solid grip, are suitable for many applications, and are also affordable. So, if you want to drive undistracted, you should pick any of these accessories.